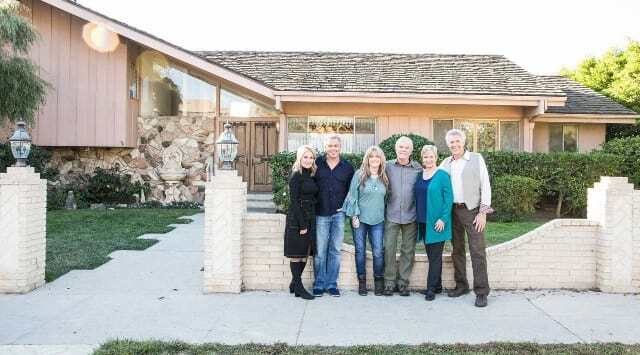 No one can forget the ranch house that served as the home for The Brady Bunch through all of their adventures, conflicts and joys during the series' run from 1969 to 1974. The house, much like the people who lived in it, became a beloved icon in television. Now, following the sale of the actual ranch house that viewers would see in exterior shots on The Brady Bunch to HGTV (after a very hot and highly publicized bidding war), the network is planning a special six-episode series focused on the home's renovation. As it turns out, HGTV also plans to reunite most of the remaining cast members to help make this renovation go smoothly. In a press release from HGTV, we learned that cast members Barry Williams, Maureen McCormick, Christopher Knight, Eve Plumb, Mike Lookinland and Susan Olsen will all gather together for the first time in 15 years in order to tour the home before it is renovated to match the studio sets that we all knew and loved as kids. Currently titled A Very Brady Renovation and expected to premiere in September 2019, the series will include a parade of celebrity guests. At the walkthrough with the original actors, a host of HGTV staples were present, including Property Brothers stars Jonathan and Drew Scott, Mina Starsiak and Karen E. Laine (Good Bones), siblings Leanne and Steve Ford (Restored by the Fords), Jasmine Roth (Hidden Potential) and Lara Spencer (Flea Market Flip). The central challenge of the show will be creating all of the details of the original sets, such as the shag carpeting, the extremely retro kitchen and the floating staircase, while keeping the integrity of the exterior view. The show's producers say the renovation will add about 2,000 square feet to the current home, along with an untold amount of '70s retro style. The Brady Bunch, which was one of the first TV shows to follow the story of a blended family, ran for five seasons between 1969 and 1974. It then ran widely in syndication and had countless television specials, spin-offs and reboots, including two feature-length satirical spoofs that aired in 1995 and 1996. While the home seen in exterior shots existed at the time, the interiors from the show were shot on sets.